And lo, there will come a time when it will be possible to talk to the other Faithful, who live at great distances. Truly, there shall be some among us who will provideth of many services for the Faithful. And they shall have a toll-free number. And when it comes time for the Believers to call these toll-free numbers, many shall not be able to speak with other Believers, but instead, will be forced to listen to the robotic voices of the Damned. And they shall be caught in a Purgatory of Expectation of Service. And they shall wait. And wait. There will be a great Irritation among the Faithful. Yet the Believers shall continue to hold, and they shall find no solace in their sojourn. The Faithful shall not blameth of the toll-free number, for it is not the fault of the numbers that they shall be made Slaves of the Evil One. Yeah, it shall be so. And the Evil One will playeth of the Easy Listening Musak, and He will rejoice! Hey, Alltop likes musak! Internety proof: Consumer Reports: What bugs Americans most. (#2 not getting a person on the phone.) 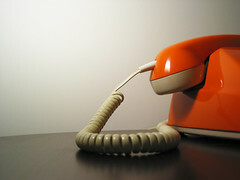 Phone image by Splorp, on Flickr. Next Post Ask General Kang: Apparently, only one in four people read a book last year — how can we improve that figure?